The Curious Bohemian: What's in your backpack? My best 'inanimate' friends in the whole world were my backpack and my walking stick. Though there was plenty of human interactions along the way, there was even more time alone when the only companionship I had was me. My backpack and my walking stick quickly became my 'friends' and I immediately depended on them as an integral part of this journey. From the beginning, I referred to them as 'Osprey', which is the brand name of the backpack itself and 'Jo', which is a martial arts stick which Jo was. Jo was gifted to me by hosts, Pastor Steve and Pastor Wanda in Spotsylvania, Virginia when I stayed with them in September. To this day, Osprey sleeps at the end of my bed and Jo lays across the floor next to me. I physically depended on Osprey and Jo for what they offered me in my 'day to day'. Osprey carried my stuff and took on the weight of it's contents and Jo kept me and Osprey balanced. Not only did Jo support some of the weight of me and Osprey but he set the pace to our rhythmic walk. Jo was always in my right hand as my 'righthand man' and together we stepped in perfect rhythm. I put my right foot forward with Jo on the '1' count and the '2, 3, 4' count would be my three step movement walking past him. Then I'd swing him and my right foot forward again and we'd repeat our 'walking dance' throughout the day. Jo also offered security from critters, like snakes, alligators, wild dogs and boar but luckily I never had to use him for any of those things. Many thought Jo was with me for protection from people but I rarely looked at Jo as a defensive tool for assailants. Though I was grateful to have him close to me if confrontation was ever in my path, Jo and I agreed that we would take the path of least resistance and avoid any negative human interaction by listening to my 'Inner Voice'. I never felt nervous that a physical confrontation would happen on my journey and only twice did I see the possibility of needing a stick for a human encounter. I believe Jo was a great thing to have and he may have 'psyched out' any possible confrontations by humans that were considering any harm to me. So having 'Jo' in hand was an overall good choice and the fact that he was a gift from a man and woman of God gave him that much more power. Jo and I will be doing the 'walking dance' for many years and I'll always carry Osprey on my back. Osprey, my backpack was my first purchase. In fact, Osprey's tags were still on her when I began training in June 2015 even though she was purchased at Eastern Mountain Sports in Ithaca on February 9th, 2009. She was a 'star' from the beginning because she graced the cover of Backpacker magazine the month that I bought her. I purchased her at half price because she was a 'return' and it was a miracle that I got her at such a great price. She was originally $239 and I bought her for $119. The previous buyer had written their initials in her so the store marked her down for being 'scarred'. Osprey was actually a pack for a medium sized man but she fit me just fine and since she was the first pack that I ever had on my body, I really didn't know the difference. When I was In Myrtle Beach, South Carolina, I stayed with a host who was a backpacker as well and she had Osprey's cousin as her pack, the 'Sage' which was made for a woman. I tried her on when Osprey wasn't looking and it was then that I realized the difference between packs for men and women. Though 'Sage' was a beauty and fit me so fine, Osprey was my pack of choice and I wouldn't trade her in for anything. Unfortunately, Osprey took a bit of a beating on this trek. She tore in many places and she tore within 500 miles. I was quite surprised since I was only carrying about 25 lbs of soft weight so when I got to South Carolina, I called the Ithaca Eastern Mountain Sports about this. 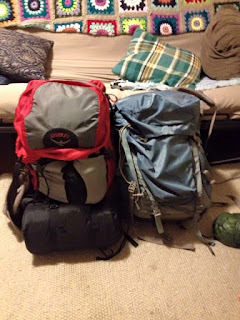 They said that the Osprey company would probably replace my pack for free but I'd have to send the old one back. The 'old one'? That wasn't going to happen. There was NO WAY that I was going to empty my Osprey, put her in a sealed cardboard box by herself and ship her to a warehouse where she would probably be thrown into the garbage. Nope, that was definitely not going to happen. Osprey was my pack, is my pack, and she will travel with me until she's too tired to do so. I duct taped her open wounds and she's been fine ever since. Osprey, Jo and I make a great team and we will not be split up anytime soon. $110 but there's always way to get discounts. I never paid full price for any of the 3 pairs of shoes that I bought. Finding the proper footwear is obviously imperative for a long journey, a much different process than getting a backpack or obtaining a walking stick. 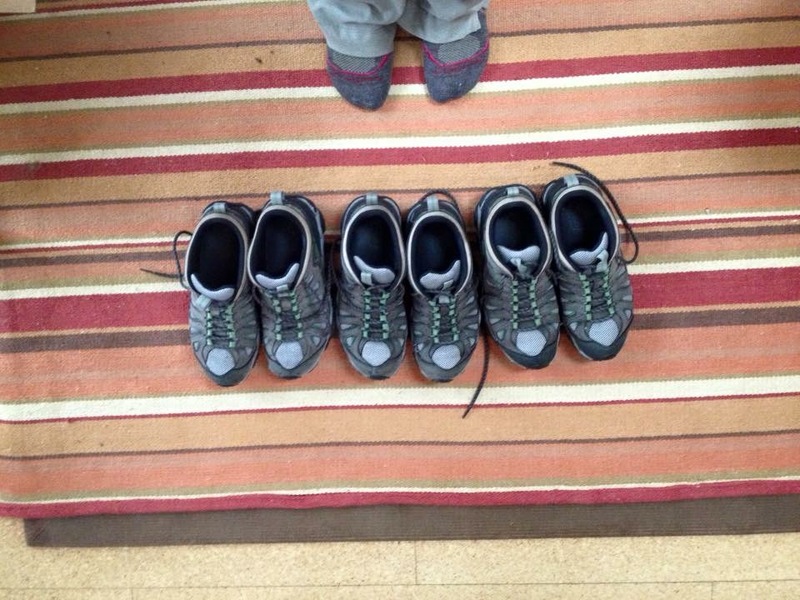 I had always been a Merrell shoe kind of girl but I knew that I had to be open to all possibilities and to take my time finding the right shoe for me. With that said, I can't emphasize enough that the right shoe for me may not be the right shoe for you so if you are thinking about a long journey by way of your feet, shop around, try them on and try many on before you purchase. Another really important factor in buying proper footwear and any expensive gear is that you find a customer service person that knows what they are talking about and is not just looking to 'make the sale'. The cool thing about stores like Eastern Mountain Sports and REI is that the sales agents aren't commission based and these two stores in particular hire really knowledgable people who genuinely care about their customers. These stores don't always pay their sales people a big hourly wage but they give them great discounts on gear and a lot of the time that is why people work there. They are adventurers who are using the products that they recommend to you and they love sharing their knowledge with like minded people. This is the kind of store that you are looking for; you want the people who are selling you your gear to be using it too, or at least know someone who is. The OBOZ SAWTOOTH LOW HIKER SHOE was good for about 500 'sidewalk and shoulder' miles. If I was a walking on natural turf they may have lasted longer but I can't report on that because I walked through cities and grass was rare. It took about 100 miles for them to be completely worn in and if I had known that, I would have prepurchased them and worn them in before I left and had them sent to me worn in. The second and third pair of OBOZ that I bought were in Annapolis, Maryland and Charleston, South Carolina. 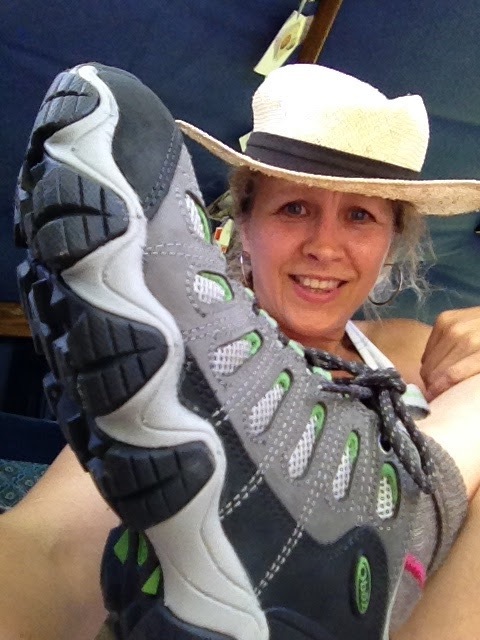 When I bought the third pair in Charleston, my feet were sore from the journey and brand new shoes felt uncomfortable for at least two weeks, about 100 miles. Every step that I took felt like I was walking on bruised feet but after the first 100 miles, the shoes felt great. Walking on the grass next to highway shoulders with a 'low rise' shoe wasn't a good idea. The grass along highways is not even and often has dips, holes and unseen hazards which twice during my trek unexpectedly made my ankle buckle. When walking in a good solid pace for 8-10 miles, you don't need any surprises that can catch you off guard and make your body jolt or waiver. I chose to stay on the actual highway shoulders to ensure a smooth walk; I just had to watch out for the texting drivers and disgruntled morning traffickers heading in my direction to stay safe. 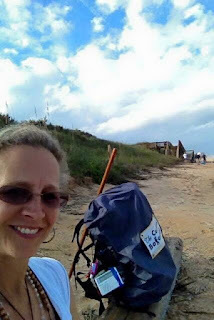 I walked approximately 600 miles along the highways and had tens of thousands of cars drive by me. Good footwear that you feel safe and secure in is monumental for a successful journey. OBOZ Sawtooth were great for my feet because of the cloud like step and the solid stepping platform; a high top in my case wasn't necessary. Overall, the OBOZ Sawtooth served me well. I would use them again as my first 'go to' shoe due to their comfy built in pad and cloud like feel with the tapered off heel. But once again, every foot is different and not every shoe is right for all feet so try on as many as you can before you make a purchase. Good shoes are pricey but well worth the cost when they are your 'vehicle'. My umbrella was used A LOT! It was used more for a shield from the sun than a barrier against rain. When I left NYC I was still a 'rookie' adventurer; I didn't drink enough water, I didn't use any topical sunscreen, I didn't wear a protective hat and I was completely exposed to the elements. BIG MISTAKE #1! It was on Day 5 when I reached Trenton, New Jersey that I had become disoriented and almost went down for the count on the side of a busy highway. That story will be told in a later blog but the point here is, protect yourself from the sun at all costs. For at least 90% of my trek from New Jersey to Miami, I had my umbrella protecting me from the sun. Nature has no mercy for the stupid and walking in direct heat without protection is completely stupid. So for my trip, the umbrella was more of a sunscreen than a rain protector but I did use it a couple of times for light rain. Though I carried a rain jacket, it really wasn't necessary. I could have used a disposable plastic poncho that was substantially less weight and less bulky but I chose the jacket. In my thinking, I thought of the jacket as another layer of clothing in the event I was cold at night but in reality, my sleeping bag and 4 layers of clothing was sufficient. 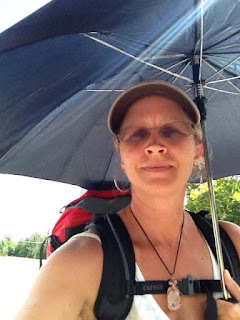 Unless I intend to be in nature on a hike where I can't get off the trail and into a dry fast food place, I would not bring a rain jacket on my next urban trek. I brought this specifically to cover Osprey in the event I got caught in the rain and I didn't have a safe place to stay dry. I used it on a few occasions and I think it was a good item to have. Not only did it keep my entire backpack dry from any water, Osprey fit perfectly inside in it. It was even more helpful when I was in Awendaw, South Carolina sleeping in a big shed that was loaded with Palmetto cockroaches. That story will be told in a later chapter but trust me when I say 'loaded', I'm talking 100's of coach roaches. The last thing I ever wanted or needed was to be carrying a cockroach in my pack and passing it off to anyone. The plastic bag served a very good purpose and was worth having for this one incident alone. I also think that the bag would have made a good ground cover or a bag to put Osprey in if I needed to float her down any water. I'd pack this again. Even though my intention was to find hosts and to sleep inside, I couldn't rely on that and I had to be prepared for some nights outside. The mat that I brought ended up being of utmost importance as a comfy thing to sit on when I was 'copping a squat' on the ground outside a convenient store or sitting on a park bench putting my feet up. 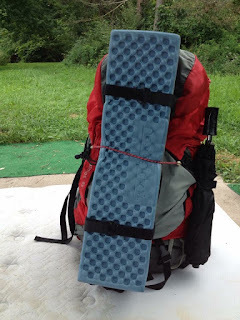 The mat I chose was incredibly lightweight at ~8 ounces and though it was a nice added 1/2" of padding when I did sleep outside, I was more grateful having it as a seat cushion. I list the camp pad before my sleeping bag because it was used substantially more than my sleeping bag. I chose this sleeping bag because it was affordable and lightweight. I wasn't going to be sleeping outside as my first choice and a sleeping bag would be used more for a back up form of sleeping attire than a preferred one. I also had lots of experience sleeping in weather 40-50 degrees when I lived in my van at camp so layers of clothing coupled with a sleeping bag was more than enough. The MARMOT ASPEN 'MINIMALIST' SLEEPING BAG packed up small, was lightweight and was well priced. It's machine washable and can simply be put in the dryer. It air drys fast too. $16.95 but this was a 'parting gift' from my Eastern Mountain Sports coach, Matthew! An emergency BIVVY is a very lightweight blanket used to repel your own body heat back to you. Fortunately I never had to use this item but having it was great for my 'peace of mind'. For the weight of it and it being the size of my fist, it was a wonderful item to have in the event I was caught in very cold weather and my sleeping bag wasn't keeping me warm enough. More than it's value in weight and size, it was a gift from Matthew just hours before I left. He had my best interest and that value was immeasurable. Let's face it, if you're going to be carrying your life on your back, it's up to you whether or not you need to be looking good and whether the extra clothing is worth the weight of vanity. My suggestion is to keep it light, and in my case, I was walking to a different town every day so no one knew if I was wearing the same clothes or not so who cares, right? I'm a minimalist and have been dreaming of the day where I wouldn't have to pick out an outfit everyday so I was in absolute Heaven having just a few items of clothing to consider on any given day. It's the same way when you're hiking in the woods; if 'looking good' is something that is of big concern to you, you're probably not in the right sport. You may want to try walking the 'runway' not the trail. The compression bag was an item that I never heard of until Matthew gave me his before I left. It was such an important item in my pack because it compressed clothes down to the minimum bulk possible. This is so important when you're trying to fit everything into your pack. Now please remember that it doesn't remove weight, my clothes still weighed the same but I could fit more items into my pack and the pack itself was more even because of the compression bag being centered in the middle of it. It's a 'must have' for sure. The 'quick drying' clothing is much better than any of the cotton items that I had except for my cotton t-shirt that I wore every day that said, "BE YOU". It was worth the extra weight and I wore it, not carried it every day. Since I stayed in people's homes the majority of the time, I was able to do laundry on a regular basis. However, if I was hiking in the woods, I definitely would stick with the 'quick drying' sports shirts and leave my cotton shirts at home (if I had one). When I was walking in extreme heat, the long sleeve items like my cool weather sweatshirt were stored in my pack which made my pack heavier and bulkier. In the future I will not carry these things and go to a thrift store and buy the warmer clothes when I need them for a couple of bucks. Quite often, these items were offered to me by my hosts because let's face it, most people have stuff they want to get rid of and who better to give it to than a most grateful bohemian walking the coast. Once again, I can only speak about the clothing that I needed on my particular journey through cities. The resources in the woods are much different so carrying these things may be mandatory but I'm sure there are great lightweight options for 'warm wear' in lieu of cotton sweatshirts. As far as leg wear goes, I wore pants whenever possible even if it was a bit warm. Being a woman alone walking into the unknown, it only made sense to keep myself as 'desexualized' as possible. Though most men were kind on my journey, I'm sure there were a few out there whose mind strayed into a filthy place. Having ugly clothes was planned and I wore as much clothing as I could endure in even the hottest of circumstances. In the extreme heat I wore the 'cut off' shorts that went just above my knees and occasionally I would wear the lightweight skirt if my shorts were dirty and stinking like 'pee' and sweat. Yes, you will smell on occasion, especially when you're peeing outside next to a highway and you can't spend a lot of time cleaning yourself up if you know what I mean. That's where my 'baby wipes' came in handy when I took a break at a local eatery or gas station. Luckily I had hosts for most of my trip, I only slept outside 7 times, so getting a daily shower was in my 'day to day'. Thank GOD! Matthew from EMS recommended medium SMART WOOL socks when I was choosing my footwear. I was very happy with the brand. Even though it was hot outside, wool pulls moisture away from your skin and also gives an extra cushion in your shoes. Heavy wool socks would have been too much and not necessary and anything lighter than the ones that I chose wouldn't have given me the extra cushion. The weather on my trip ranged from 45 - 90 degrees and the medium wool socks were perfect. I carried 3 pairs of underwear because sometimes you'd need to change them twice in a day. It was not uncommon for me to wash my socks and underwear in a sink at a local gas station every day. It's just the way it is. You're going to want a purse or something that you can put your 'quick grab' items in so you're not constantly removing your pack and a 'fanny' pack was the optimal choice for me. I put my phone, my chargers, $10 or so, lip balm and my eyeglasses in it. I wore my money belt under my clothing which had my passport, driver's license, my debit card and another $20. I wore a cap after Day 5 and my warm and fuzzy hat was kept in my pack for cooler days and for evening sleep. Often I would pull the fuzzy hat over my face to block the glare from the street lights and also to shield me from bugs. My radio was a gift from my daughter and it was such a 'gift' on this journey. It had a CB on it and it also had a crankable battery charging system in the event the batteries were dead. This feature wasn't optimal because you would have to crank it quite a bit for it to hold a long charge but in the event of an emergency, the crank could save your life. I didn't use the CB features but I definitely used the radio. I never had it on too loud where I couldn't hear people or things around me but the days would have been very long if I only listened to motor vehicles zipping past me. Music, talk radio and the weather station were awesome to have in my 'day to day'. It's not a necessity but it was for me on this trip and will be on any future trips. Filtered water is a must for me and the LIFE STRAW company offers lots of options for this. I carried an actual LIFE STRAW straw that could be used by directly drinking from murky water but on this trip I used the screw on filter with water pouch that you put tap water in. Unfortunately the LIFE STRAW unit I had sprung a leak by the third month and getting in touch with the company to get a replacement part was fruitless. Miraculously Planet Fitness gifted me with their own filtered water bottle within the same week that the LIFE STRAW blew out and my clean water system was up and running again. PLANET FITNESS ROCKS! 1 bowl was used to make my guacamole and salads for my 'Bohemian picnics' outside random grocery stores. The other bowl was used to 'pee' in. They both were used quite a lot but please make sure you mark each one. This is one item that you don't want to get mixed up. Yikes! I originally packed a first aid kit and sewing kit but found that it was just extra weight and really not necessary since I was walking on roads where there were people in case of an emergency and drug stores if I needed any bandages or ointments. Baby wipes were a 'must have' for me to keep me feeling clean during days of sweating and peeing outside. You'd be surprised how fast you smell 'nasty' when you miss a shower for one day. I didn't start with the 2 tablets but I did end with them. They were both gifts to me from hosts who encouraged me to write my book. I am using them now for this purpose. Thank you Fran from Deerfield, Florida and Ina from Crofton, Maryland! I carried 2 'bullet' style chargers that were always charged when I left my host's house. I used 'maps' on my cell phone a lot and would keep in contact with my FB posts throughout the day. For this reason I will always have 2 charging 'bullets' with me for any journey. I encourage you to travel with a debit/credit card that is 'chipped'. This will prevent theft and it's free to have. 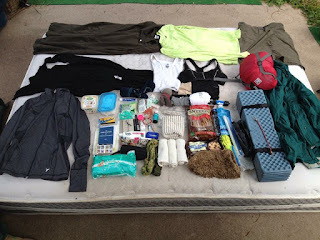 *This is the list of the items that was in my backpack when I finished my trek. I find these items to have been the most useful for a 6 month journey walking through temperatures from 50-90 degrees. Basically, this is what I would probably pack in the future. GOOD LUCK AND DON'T HESITATE TO CONTACT ME WITH ANY QUESTIONS!